P&O Cruises’ Britannia sailed into Southampton for the first time today. 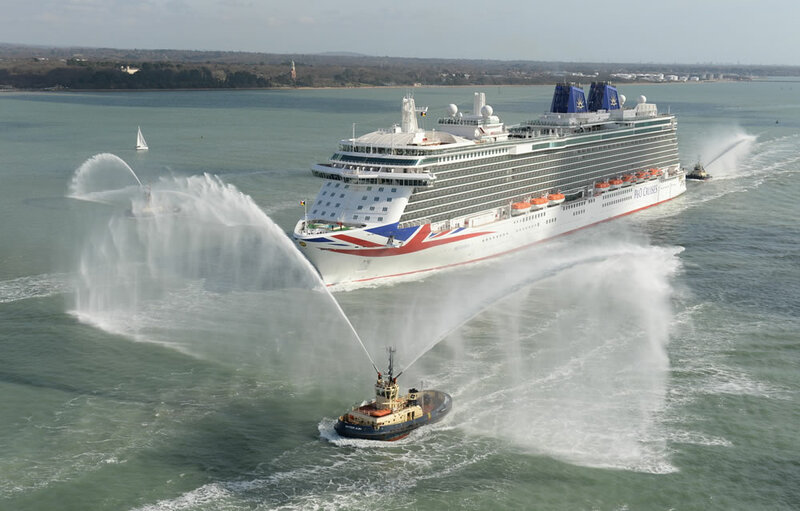 P&O Cruises have uploaded a brief video showcasing the highlights of the event including the traditional water canon welcome. Crowds of spectators, many holding Union Jack flags, eagerly awaited her arrival across from Mayflower park where she turned around 180 degrees before successfully docking at the Ocean Cruise Terminal. A second video has also been uploaded by P&O Cruises. This features a brief interview with Captain Paul Brown prior to the sail-in as well as clips of Eric Lanlard, Christopher Edgington (P&O Cruises’ Marketing Director), and Neil Oliver (Entertainment Manager on-board). It also shows the marching band that entertained the crowds at Mayflower park together with the pair of parachutists who carried a Union Jack flag to celebrate Britannia‘s arrival.